Wordless Wednesday – Pranking your running buddy! When I was looking for this recipe to make for this year’s annual holiday potluck at work I realized that I never shared it on my webpage. I first made these holiday-themed meatballs back in 2010, which is when the above photo was taken. I’ll take a new one the next time I have a chance. 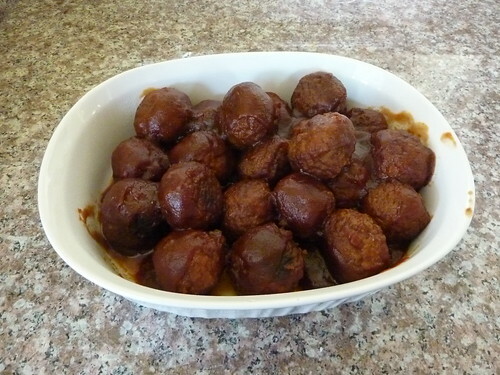 My only complaint about this recipe six years ago is that I didn’t like the meatballs I used (Italian style), so this time I used Foster Farms frozen turkey meatballs and they worked really well. I also increased the amount of meatballs, BBQ sauce, and soy sauce. If I hadn’t needed to open another can of cranberry sauce I probably would have added more of that as well! Of course I tested the meatballs before I put them out for public consumption during last Friday’s lunch, and I loved them. It seems everyone else enjoyed them as well because they disappeared quickly! Mark this recipe as a winner. It’s incredibly simple, holiday-appropriate, and tasty. What else could you ask for? Next time I might try some whole berry cranberry sauce in place of the jellied variety, and maybe some sweeter BBQ sauce, but otherwise I have no suggestions. Make these for your holiday party this year! In a small bowl stir together the BBQ sauce, cranberry sauce, and soy sauce. It just needs to be roughly mixed so I used a fork. Pour half of the sauce mixture into the bottom of the Crockpot, preferably with a liner to make clean up a breeze. Then dump the frozen meatballs in the Crockpot and top with the remaining sauce. Cook on low for about 6 hours, stirring occasionally to ensure even sauce coverage, or until the meatballs are cooked and sufficiently hot. Enjoy! Based on A Year of Slow Cooking’s Turkey Meatballs with Cranberry Barbecue Sauce. It’s six days until Christmas and my tree is finally up (done after my 20 mile run yesterday) and fully trimmed (as of tonight). Took me long enough! I got a new pencil-style Christmas tree this year from Treetopia due to the lack of appropriate space for one of a more generous girth in my living room. 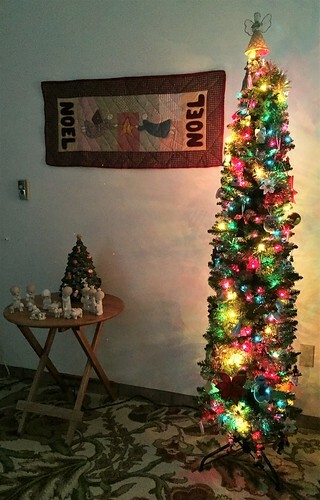 The new tree is 6′ tall, but only 18″ wide at the base and it’s just perfect. I love it. And one of the best things is that the old angel ornament from Kmart that I’ve been using as a tree topper for the last 14 years still works! Next year I’ll have to prioritize finding a new tree topper (and a tree skirt), but for now my little angel is still doing a great job. I did buy six new ornaments this year (including a Kylo Ren!) which is probably going overboard. That number is not quite balanced by the three ornaments that I got rid of either. One animated Peanuts ornament was leaking battery acid so it definitely had to go. Yikes! And as I was putting on the last few ornaments tonight I came up with this little Christmas countdown based on the demographics of my collection. I can’t believe Christmas is only six days away, but at least I’m finally ready! Today my marathon training plan reached its zenith when I successfully completed a 20 mile run. I was anxious about it all week since I’d never run that far before, but this morning I pushed all of my worries aside as I got ready to go. 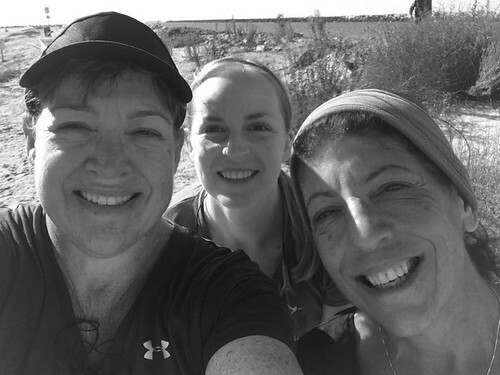 My usual running buddies were going with me so I knew I could count on them to keep me from being nervous as we racked up the miles. Since a storm came through Los Angeles on Thursday it was quite chilly this morning when we set out on the San Gabriel River path at 6:45 AM. The temperature was in the upper 30s so I had not just my arm warmers, but a pair of gloves too. 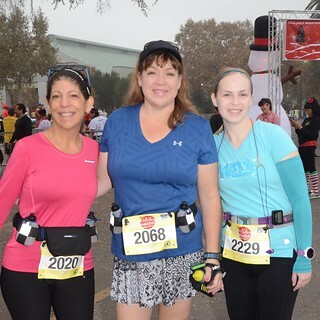 These Southern California ladies were cold for the first few miles! I took the gloves off after about 2 miles and tucked them into my belt, but I wore the arm warmers for 6 miles, which is unprecedented. Much to my surprise I felt great during a majority of the run and I know the winter weather contributed to that. I guess the strict training plan that I’ve stuck to for the last fifteen weeks has really paid off! I didn’t even start to feel tired until after the half marathon mark which was a miracle. It did get a lot warmer during the slightly over 4 hours that it took us to finish the 20 miles (my average pace was 12:01 min/mile). I started feeling pretty toasty as I got near the end and the lack of shade on the river path didn’t help either. Luckily I kept the nausea at bay that plagued me as I wrapped up my 18 mile run two weeks ago. Diluting my sports drink and alternating between caffeinated Gu gels and non-caffeinated ones made all the difference. I’m glad I figured these things out before the marathon next month. Is the Walt Disney Marathon really only three weeks away? Holy cow! Looking back at the beginning of my running journey in 2013 I never would have imagined that I’d run 20 miles in preparation for a marathon. But here I am, with a completely successful 20 mile run behind me, and I think I’m just about ready! I’m excited! Speaking of breakfast, I’m not sure if you’ll believe it, but I only had two scones yesterday – one caramel apple one and one maple bacon. They were amazing, but I didn’t want to go overboard before 9 AM. However, those two scones were accompanied by half of a waffle, a glass of milk, and a little hot chocolate. Maybe I did go overboard after all, but my scone consumption was still significantly reduced this year. When lunchtime rolled around I was still pretty full from breakfast, but I still loaded my plate with Chinese chicken salad, BBQ lil smokies, stuffing, and sweet potato casserole from the buffet. My contribution to the feast was turkey meatballs with cranberry barbeque sauce which turned out really well – and disappeared fast! I started cooking them in my other Crockpot at 6 AM so they were just right when everyone was ready for lunch. This was just the second time using the recipe, but this time I used a whole cup of barbeque sauce rather than the usual 1/2 cup, and I think the sauce was great. I’ll have to make those more often. 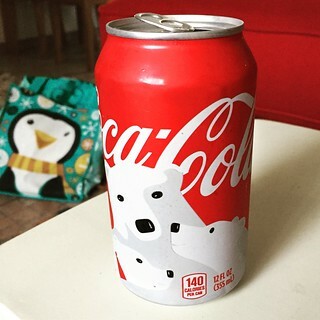 I did indulge in a rare can of Coke, as you can see in the above photo, because of the cute polar bears on the can. After all of the food I consumed at breakfast and lunch I absolutely zero room for dessert. Nothing looked at that exciting to me anyway, but I did take a couple of extra scones back to my desk with me. I thought they’d be great when I got hungry later. But by the end of the day I was still so full that the idea of eating them didn’t appeal to me at all so I shared them to my cubical neighbors. ‘Tis the season for giving! As usual, my favorite day of the year didn’t disappoint. Good food and a lot of laughs with my co-workers. I can’t wait for nest year! I went to work at 5 AM this morning to support an ongoing event. Due to a few issues that cropped up I was able to leave around 10 AM and have the rest of the day to myself. The weather forecast showed a storm approaching in the afternoon so I wanted to get a few things done before it started to rain. Also, I definitely needed to get my 5 mile run done if I wanted to avoid getting soaked. So after taking a couple of packages to the Post Office I went to the grocery store to pick up all of the necessary ingredients for tomorrow’s annual holiday potluck at work. I’d waited until the last minute to buy the milk, cream, etc. for the Crockpot hot chocolate I’m making for breakfast in the morning. Over the last few years it’s become one of my co-worker’s favorite things so I know they’ll drink it all very quickly tomorrow. For the lunch buffet I’m just making some cranberry barbeque meatballs, a recipe I haven’t made in over 8 years, because I already had all of the components and they don’t require much effort. My favorite kind of cooking! When I went to the grocery store it was much busier than usual, especially for noon on a weekday. I’m not sure if the impending storm spurred people to run their errands early, like I did, but I had a decent wait in the checkout line. And then when I finally got to the cashier she told me that she had already asked to leave work early to avoid the rain. It’s just rain! It’s not as if snow is piling up everywhere, like it is in so many other parts of the country. Get a grip, Los Angeleans! We are definitely spoiled with the nearly perfect weather here in Southern California. That being said, I was determined to complete my required 5 mile run before the first of the raindrops fell. And I was mostly successful. It started drizzling on me during my last mile, but it wasn’t enough rain to cause any real problems. Thankfully I was back in my warm house before the precipitation became significant. Now I can only hope that it’s not raining too hard when I need to drag all of my potluck items in to work tomorrow morning. It’s my favorite day of the year and a little rain isn’t going to dampen my spirits! It’s funny how often I’ve vowed never to run a particular race again, only to find myself back there at some point. I this case it took me two years, and encouragement from my running buddies, for me to sign up for a repeat of the Golden Snowflake Challenge. The first time I ran the Holiday Half Marathon two years ago I hated how hilly it was. I wasn’t all that used to running long distances (I think it was only my third half marathon?) and my overall fitness wasn’t the best, so the uphill portions of the course were not enjoyable. Luckily things were different this time around. Last Saturday morning was the first part of the Golden Snowflake Challenge – the Holiday 5K. The first half or so of the 5K course is steadily uphill, but then it finishes with a lovely gradual downhill that makes you feel like you’re flying. I was prepared for that this year and I was excited to see how well I could handle it. The first two miles were just OK, averaging about 10:30 min/mile which wasn’t terrible, but then the amazing downhill portion kicked in. My last mile was under 10 minutes, which earned me a 5K PR of 31:45 minutes! That’s 2 minutes faster that I ran the Long Beach 5K back in October so I was really pleased. The fall is definitely PR season thanks to the rigors of marathon training and running with friends who push me to increase my pace. It’s a lot of fun! The Holiday Half Marathon on Sunday morning wasn’t quite as fun. 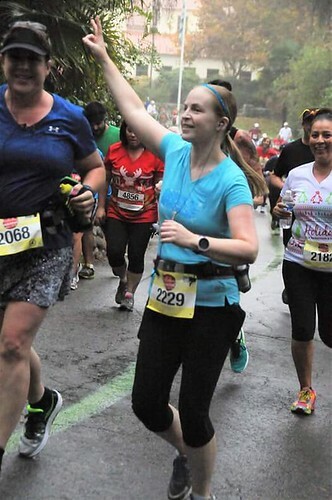 Not only did we have to tackle those same hills that I hated in 2014, but it was drizzling heavily on us for most of the race. The temperature was in the 50s which was great, but thanks to the rain we were pretty soaked. The good news is that since I’m in much better shape these days the hills didn’t feel nearly as difficult as they did two years ago. Still challenging, but I was able to maintain my running intervals without taking extra walk breaks on the inclines. In spite of our legs feeling incredibly sore from boot camp on Friday and the 5K on Saturday, my running buddy and I finished the half marathon in 2:35:06. It wasn’t a PR for me (I hung back a bit to run with her), but it’s still really good compared to some of our other race times from earlier this year. That’s 20 minutes faster than the OC Half Marathon. We’ve both improved so much since May! It was a great way to end the 2016 race season. Here’s to an even better 2017! I only made four official resolutions in 2016, and my adherence to some of those has been less than dedicated. But that’s a post more suited to the end of the month when I admit how much of a slacker I’ve been over the last 365 days. Luckily I actually satisfied two draft resolutions that I made at the beginning of the year, but never seriously committed to. This happens so rarely that I wanted to take credit for these successes while I can! At the end of last year I realized that running had become my only form of exercise, and I wasn’t even doing that with enough consistency. Going to my weekly spin class (when I actually made an effort to get there) wasn’t really helping because I needed something besides another form of cardio. I knew that if I wanted to be stronger and overall healthier that I needed to diversify my workouts. Unfortunately this wasn’t something that I was motivated to improve on my own. Luckily in June my running buddy invited me to try a class at her gym and I’ve been going to a couple of classes every week since then. It’s amazing! Not only have I changed my body’s shape (a combination of diet and exercise), but I’ve also changed my body’s composition. Over the summer I got a fancy Withings scale that sends data to my phone and tracks my statistics in an app. Since September not only have I gotten lighter, but my muscle mass has increased and my body fat has decreased. I am so pleased with my progress and I hope I can keep it up in 2017. I’ve already written so much about this one that you’re probably tired of reading about it! In the past three months I’ve bragged about how some old clothes (and some new ones too) are now too big, and others are finally wearable again. As another example, today I wore a favorite blazer to work that I haven’t fit in to for about two years. And the jeans I wore with it have also been sitting in a box for the same amount of time. They are even a little big! My winter wardrobe is now much larger and I didn’t have to spend a dime! However, I have made a few apparel purchases over the last month as a celebration of my diet/exercise success. Clothes are actually fun when you don’t hate your body! My mom and I had a blast shopping in Tallahassee at Thanksgiving, my Cyber Monday shopping was heavy on clothing, and I found several other items for myself at the Ontario Mills Outlet Mall over the weekend. ‘Tis the season for consumerism! But it’s even more satisfying when I can easily wear items that I haven’t dared try on for years due to my weight. At this rate 2017 is going to be amazing. I thought I’d have plenty of time to write a couple of webpage posts this weekend while I was in Pomona for the Holiday Half Marathon and 5K races (the combination of which is the Golden Snowflake Challenge), but that didn’t turn out to be the case. When will I learn that December is far too busy to have any free time? I actually had a lot of plans for the weekend, but I only accomplished a few of the items on my to do list. Besides the two races, I did finally complete all of my 2016 Christmas cards, though, which was a huge effort. The grand total this year was 53 cards. Yikes! Unfortunately I didn’t get my Christmas tree put up like I wanted to. I’m disappointed about that. My time management needs to be a bit better this week, especially since I’ll be tackling the highest mileage of my marathon training plan. It’s very daunting, but I think I can do it. It remains to be seen if I can get anything else done this week, though. I guess we’ll find out! Last week I ordered a Christmas running shirt from my favorite company so that I’d have something to wear for the Holiday Half Marathon this Sunday. It’s a red shirt with a reindeer and Christmas lights on it – perfect, right? I knew I was cutting it a little close for delivery before the race, but I haven’t had any trouble getting apparel from this company in a short period of time. Unfortunately this has been the exception. As of this evening the shirt has yet to ship. There’s about zero chance it will arrive in time for me to wear it on Sunday now and I’m annoyed. I know it’s mostly my own fault for not ordering earlier, but what’s the point of getting a Christmas running shirt after my only holiday race weekend (5K on Saturday, half marathon on Sunday)? I guess I’ll stick it in a drawer for next year. 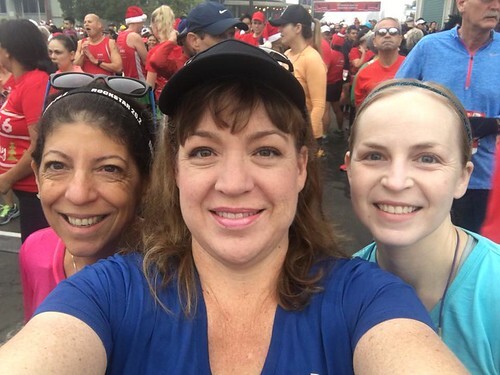 (Yes, my running buddies and I have already started thinking about which races we want to run in December 2017!) The only Christmas-themed running shirt that I have in my possession is from a race last year and it has long sleeves. There is absolutely no reason to have long sleeve running shirts in Los Angeles. They are useless because it doesn’t get nearly cold enough here! Usually I wear arm warmers when I start a run on a cold morning, but I take them off after a mile or two when I’ve sufficiently warmed up. The climate is just too mild here to require full arm coverage for very long. So the big question is, what do I wear for my races this weekend? I’m thinking of wearing a shirt that says “Will Train for Chocolate” for the 5K (appropriate since I consume more chocolate during the winter holidays than any other time of the year), and then my “Frozen” Elsa shirt for the half marathon (snowflakes seem fitting for a December run). I know I’m over thinking this, but these are my last two races of 2016 and I want them to be great!